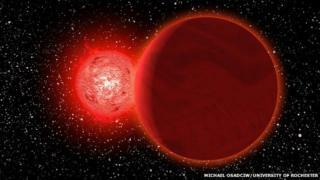 An international team of researchers says it came five times closer than our current nearest neighbour - Proxima Centauri. The object, a red dwarf known as Scholz's star, cruised through the outer reaches of the Solar System - a region known as the Oort Cloud. Scholz's star was not alone; it was accompanied on its travels by an object known as a brown dwarf. These are essentially failed stars that lacked the necessary mass to get fusion going in their cores. Observations of the dim star's trajectory suggest that 70,000 years ago this cosmic infiltrator passed within 0.8 light years of the Sun. By comparison, Proxima Centauri is 4.2 light years away. In the paper, astronomers led by Eric Mamajek at the University of Rochester, New York, say they are 98% certain that Scholz's star travelled through what is known as the "outer Oort Cloud" - a region at the edge of the Solar System filled with trillions of comets a mile or more across. This region is like a spherical shell around the Solar System and may extend out to as much as 100,000 Astronomical Units, or AU (one AU is the distance between the Earth and the Sun). The Oort Cloud is thought to give rise to long-period comets that can swing past the Sun when their orbits are disturbed. To determine the trajectory of the star, the researchers needed two pieces of information: the change in distance from the Sun to the star (its radial velocity) and the star's motion across the sky (its tangential velocity). Scholz's star currently lies 20 light years away - making it a fairly nearby system. But it showed very slow tangential motion for a star this close. This indicated that it was either moving away from us or towards a future close encounter with the Solar System. The radial velocity measurements confirmed that the binary star system was actually speeding away from us. By tracing its movements back in time, they found its close shave with the Sun occurred some 70,000 years ago. A star passing through the Oort Cloud could potentially play gravitational havoc with the orbits of comets there, sending them on trajectories into the inner Solar System. But Dr Mamajek believes the effects of Scholz's star on our cosmic neighbourhood were "negligible". "There are trillions of comets in the Oort cloud and likely some of them were perturbed by this object," he told BBC News. "But so far it seems unlikely that this star actually triggered a significant 'comet shower'." The effect of a passing star on the Oort Cloud is a function of the star's mass, speed and proximity. The worst case scenario for stirring up comets would be a slow-moving, massive star that came close to the Sun. Scholz's star came relatively close, but the binary system (the red dwarf and its brown dwarf companion) has a low mass and it was speeding by. These factors conspired to make its effect on the Oort Cloud very small. While this is the closest flyby detected so far, Dr Mamajek thinks it's not uncommon for alien stars to buzz the Sun. He says a star probably passes through the Oort Cloud every 100,000 years, or so. But he suggests an approach as close - or closer - than that made by Scholz's star is somewhat rarer. Dr Mamajek said mathematical simulations show such an event occurs on average about once every nine million years. "So it is a bit of a strange coincidence that we happen to have caught one that passed so close within the past 100,000 years or so," he said.